성인이 된 이후에는 교육을 받을 수 있는 기회가 사실상 줄어들고 있습니다. 그러나 전 생애주기별로 누구나 학습에 대한 욕구가 있기 마련입니다. 단순히 인문학을 통해서 머리를 깨우치는 것에서 나아가 문화예술교육을 통한 경험과 체험으로 이성적이며, 합리적인 행위를 실천해나가는 것이 필요합니다. 성인 시각장애인들에게는 이러한 문화예술을 향유할 수 있는 기회가 상대적으로 더 부족한 현실입니다. '힘! 프로그램은 학교를 졸업하고 문화·예술적 경험을 향유하기 어려운 성인 시각장애인이 참여 할 수 있는 아트프로그램입니다. 각 분야의 전문가들과의 만남을 통해 전문적 지식과 수준 높은 경험을 쌓고 오감을 활용한 미술로 자기표현과 자기발견의 기회를 마련하고 취미활동과 더 나아가 전문직 진출의 가능성도 기대합니다. 실제 이 프로그램을 통해서 작가 인큐베이팅의 기회를 가진 참여자도 있습니다. 1년 총 16회 수업, 평균 참가자 수는 10명 이내이며 서포터즈와 1:1 수업으로 진행한다. Visually impaired people tend to lose many opportunities for continued education once they become legal adults. The desire to learn, however, is something that persists over the course of lifetime development. At Another Way of Seeing, we believe that it is not enough to gain simple knowledge; there is much more to take away from first-hand experience through artistic and cultural activities. Unfortunately, it is currently not easy for visually impaired adults to find opportunities to participate in art and culture. 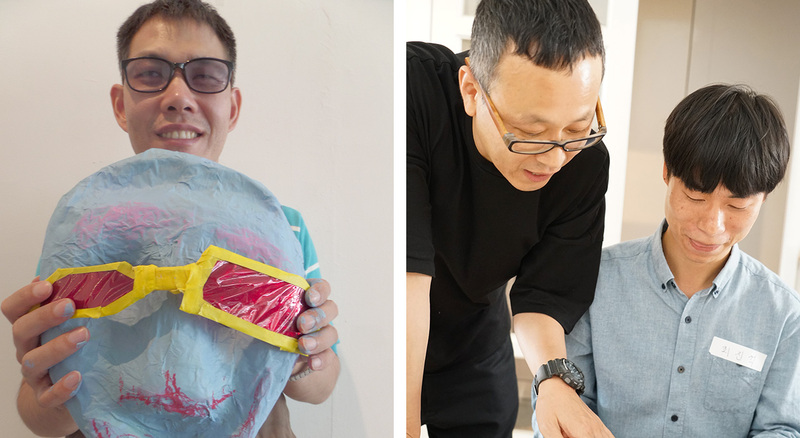 The ‘Him(Strength)!’ project is a series of art programs designed for visually impaired adults who face difficulties in finding opportunities for artistic or creative development. The curriculum includes meeting with professionals from various fields to build specialized knowledge and skills in artistic projects that involve all five senses. Participants are offered the chance for personal expression and introspection through art, as well as career exploratory opportunities in various creative fields. In past occasions, participation in the program has also led to artist incubation. Each session accommodates an average of 10 participants who are matched 1:1 with volunteer teaching aids(Another Way of Seeing supporters).